There are numerous stories regarding the origin of Tirupati Balaji Temple. Majority of the Tirumala legend involves Goddess Lakshmi leaving Vaikunta in protest against Sage Bhrigu going unpunished after stamping on the chest of Srihari Vishnu. Vishnu then arrives on earth in search of Goddess Lakshmi. The diversion in the legend begins after this main incident. Here is one such story associated with story of origin of Tirupati Venkateswara Temple. Sage Bhrigu once wanted to find out which was the supreme among the three qualities – Rajas (energy), Sattva (serene strength) and Tamas (unthinking irascibility). To find out, Sage Bhrigu went to God Brahma and found that the dominating quality was Rajas. The sage did not find satisfaction and went to Kailash – Shiva had no time for Bhrigu’s pursuits and threw him out of Kailash. The sage considered this as the effect of Tamas. Finally, Rishi Bhrigu entered the Vaikunta, the abode of Vishnu and found that Vishnu was asleep. Bhrigu was angry with Vishnu for sleeping instead of doing his duty of guarding the universe and in anger he kicked on Vishnu’s chest to wake him up. Vishnu showed no anger and only smiled at Sage Bhrigu. Vishnu had realized his mistake and hence thought the kick to be a suitable punishment for not performing his duty. But Goddess Lakshmi who witnessed the incident could not tolerate the behavior of Sage Bhrigu and she was even more annoyed with Vishnu for letting the sage go scot-free. Goddess Lakshmi decided to stay away from Vishnu’s chest saying He could no longer protect her from the likes of Bhrigu. Vaikunta was not the same without Lakshmi. Vishnu left Vaikunta and reached the Seshachala Hill and made his home beneath an anthill. Cows belonging to a local king sensed this. They began worshipping Venkateswara by milking under the anthill. When the cows stopped giving milk to the king, he ordered for an inquiry. Soon the king found out from his guards that the cows were shedding all the milk on an anthill. He asked the guards to dug up the anthill and found the murti of Venkateswara. He built a small temple to worship the murti. 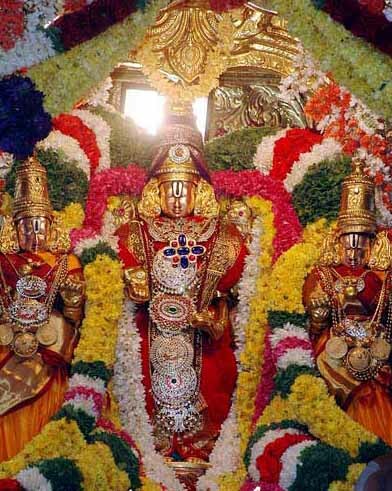 It is this small shrine that became the world famous Tirumala Tirupati Balaji Temple.